A popular British cartoon has been removed from one of China's most popular social media platforms, with state media saying that the character is being used subversively. Social media users in the country noticed video clips of the cartoon were being removed on Saturday, and on Monday, state newspaper Global Times said that the #PeppaPig hashtag had been removed from the Douyin video website, while searches for "Peppa Pig" on the site produced no results. Many papers also note that the platform appears to have added "Peppa Pig" to its list of blacklisted content. 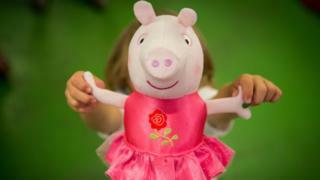 The Peppa Pig cartoon is hugely popular in China, but despite being targeted at a pre-school audience, it has found mass appeal with Chinese adults in recent months. Its characters have become a common feature in memes, including sexually suggestive content. "After Peppa Pig started to take on this subversive hue and subsequently go viral, some experts said the popularity of the cartoon demonstrates the social psychology of hunting for novelty and spoofing, which could potentially hamper positive societal morale," Global Times said. Beijing appears keen to quell subversive enthusiasm for the cartoon by trying to promote friendly domestic pig cartoons instead. Peppa Pig has been long popular with children in China, and has attracted some 34 billion views on domestic online video platforms. It was exported to China in the early 2000s, and over 100 translated episodes have aired in the mainland. It is shown on the children's channel of state broadcaster CCTV, and also hosted on a number of digital platforms, such as the Netflix-like website iQiyi. In recent weeks, however, mainstream media have noticed a mass appeal of the Peppa Pig cartoon among adults. Hong Kong newspaper South China Morning Post notes that there has been a recent frenzy for Peppa Pig products online, with users paying hundreds of yuan for goods such as "antique-style" Peppa Pig porcelain bowls. The Sina Entertainment website has also noted the popularity of the cartoon's plush toys and fairytale cakes among actresses Yang Mi, Nana Ou-yang and Zhao Liying, among others. It is not only women with a squeaky clean image that have caught what Sina calls "the Peppa Pig virus"; the website shares a number of edgy male actors and singers showing off Peppa Pig, plus toys and transfer tattoos. The wave sparked a trend of adult Chinese Sina Weibo users sharing pictures of their own Peppa Pig merchandise. Thousands of female users have shared pictures of pink fans and hair accessories adorned with the lead character, while male users have shared pictures of their stickers and watches. In recent months, state media have signalled their increasing discomfort about the growing influence of the cartoon. They have noted that its characters have become the subject of what they call deviance and manipulation among Chinese youths. Nationalist newspaper Global Times noted in January that social media users had been circulating "explicit fake versions" of the cartoon online, making references to paedophiles and sexual organs. And a recent article on the popular news portal Sohu notes that there's been a particular surge of social media users making personalised emojis and memes out of stills of the cartoon. It says that this has been particularly the case on the Snapchat-like mobile application Douyin - potentially leading to the ban. Douyin's removal of the popular cartoon from its platform is possibly just the start of a wider clampdown. It comes as part of a wider crackdown on online content the Beijing government deems vulgar or pornographic. In recent months, Chinese microblogs such as Sina Weibo have been extensively removing such content from their platforms, stressing that such material is not in keeping with a healthy online culture. Given China's millions of online users, it is extremely difficult to simply censor all content when a TV show or personality has proven so popular. Beijing normally takes steps to launch a domestically-approved version, and this is what has happened with Peppa Pig. One Chinese mobile app, Suishoupai, has launched the character "Little Pig Dodo", which the Sina Weibo microblog has widely publicised. It encourages users of Douyin to switch to Suishoupai, and to switch their Peppa Pig fascination for a Dodo the pig. Thousands of users have subsequently registered, and posted pictures of themselves next to emojis of the state-approved pig.